Another busy week at the brewery. But alas, not a lot of beer has gone out the doors. 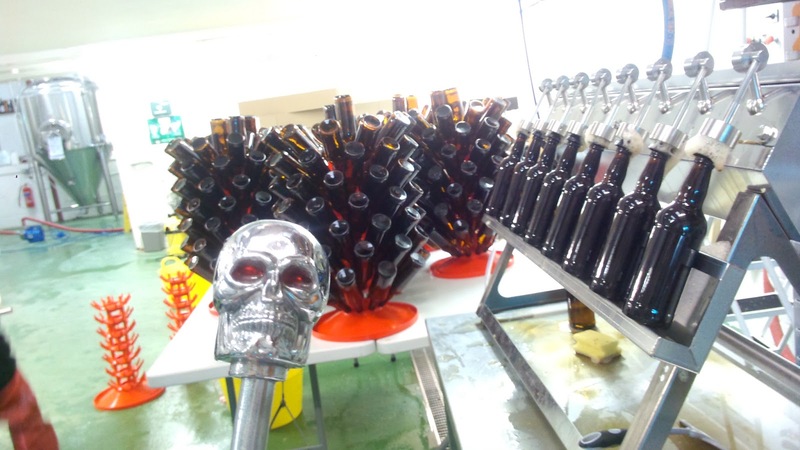 As always, there was a lot of bottling to be done. We help Ellenberg's bottle 1000 litres of their stout, the rest will go into bottles next week. But perhaps more importantly, Mariana Trench went into 6 casks, 20 Key kegs and a whole bunch of 500ml bottles. You should be able to find this beer at The White Horse in Parsons Green this weekend, for their Over The Hop Festival, along with a key keg of Miss The Lights. In the picture above you can see part of our bottling line. Sanitised bottles draining in the background, with the bottle filler on the right. The skull in the foreground is the handle of our hand caper. There were 2 Weird Beard core beers brewed. First of which was our American style IPA, Five O'clock Shadow, brewed with the dankest of U.S. hops in the form of Summit, Columbus and Apollo. The brewday went pretty smoothly for this one, and we experimented for the first time with re-pitching a batch of yeast cropped from the Mariana Trench brew last week. 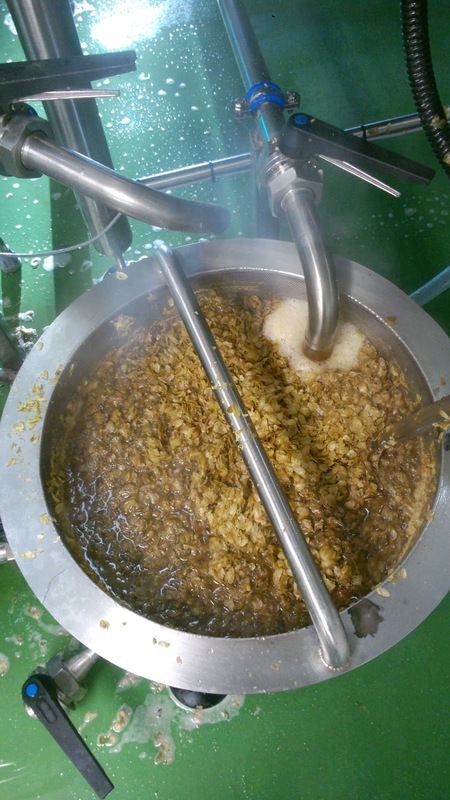 5 O'clock is currently sat in FV3, a few days away from being dry hopped. 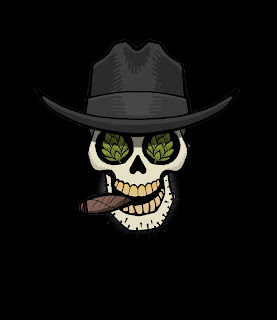 The Lup'in for this beer is a favourite of ours, and you may recognise a slightly altered cowboy on all of our caps. Next brew was our double IPA, Holy Hoppin Hell. Expect a blog in the coming weeks about this beer, but it weighs in at 9.4% with 100IBUs of bitterness. This is a beer we can have fun with, as the grist, ABV and IBUs will remain the same from brew to brew, but the late hops will change from batch to batch. This time round with got a bit of a NZ theme. We are still getting used to hop utilisation on the new brew kit and bitterness extraction from prolonged time the hops are in very hot wort. While the bitterness is being extracted from hops the delicate aroma and flavour oils are volatilized off, and these hop oils are an important part of Holy Hoppin' hell. So we went for something different with this batch, and stuck a proportion of the 5.2Kg of flame out hops in the underback. 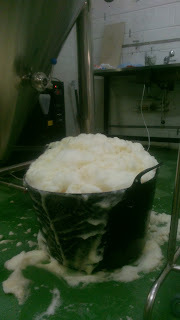 The cupcake picture above is a bucket we put on the floor to try and catch some of the foam coming from the top of the fermenter as it was filled, check out the short video at the end of the blog. 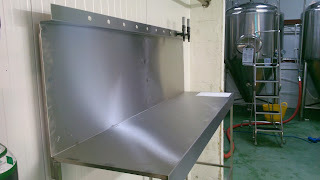 An exciting delivery came this week in the shape of our stainless steel bar. Don't get excited, we are not opening a tap house or sample room, as we are not licensed to sell at the brewery, yet. The idea of this is to have a few samples of core beers, and hopefully some prototypes for any guests, future customers and people who volunteer for a days bottling to sample. There will be a total of 10 taps. We also think it will ge a good place to just hang out and relax at the end of a hard day, or to persuade people to stock our product. We have a quiet week ahead, as both beers we have fermenting will require dry hopping for around a week. 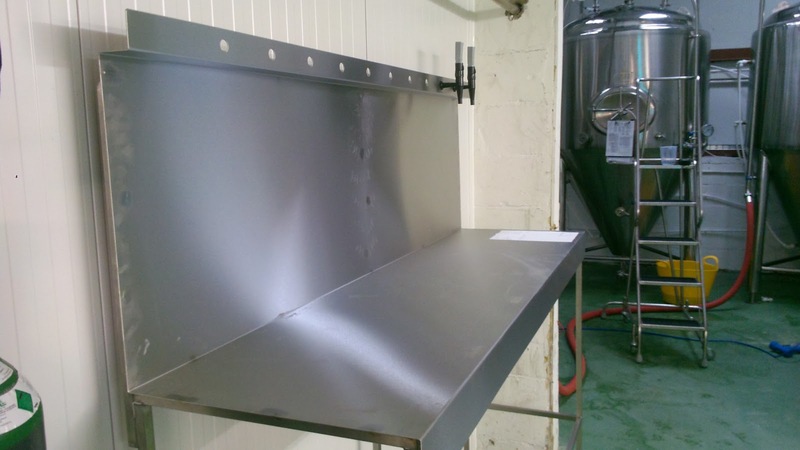 So hopefully some time to get the bar up and running and complete some other outstanding jobs around the brewery. Don't forget to get over to the Bull in Highgate and the White Horse in Parsons Green for a chance to get you hands on some Weird Beard beers. As promised, above is a short video of Holy Hoppin' Hell being transferred into FV4. It get very excited and started spilling foam out of the top from about 2/3rds full. All views and grammatical errors are those of @weirdbeardbryan and not always the Weird Beard collective.